Count me as one of many reviewers who watched the trailer to Paddington and worried that I would have to write a negative review. The preview offered an extended cut of a bathroom scene, which I knew would be funny for the kids. I was worried that in the name of making a film attractive to kids, the directors would place heavy emphasis on the gross, and not enough attention to those parts of Paddington that have made him a beloved character since he first came into our lives many years ago. It was a preview that didn’t jibe with my memories of having the books first read to me, then reading them myself as a child. Michael Bond’s creation was probably one of the first books I read by myself that had chapters, as it probably is for a lot of readers. Reducing him to the gross would have been just as rude as trying too hard to make him interesting to adults by giving him sexual desires. 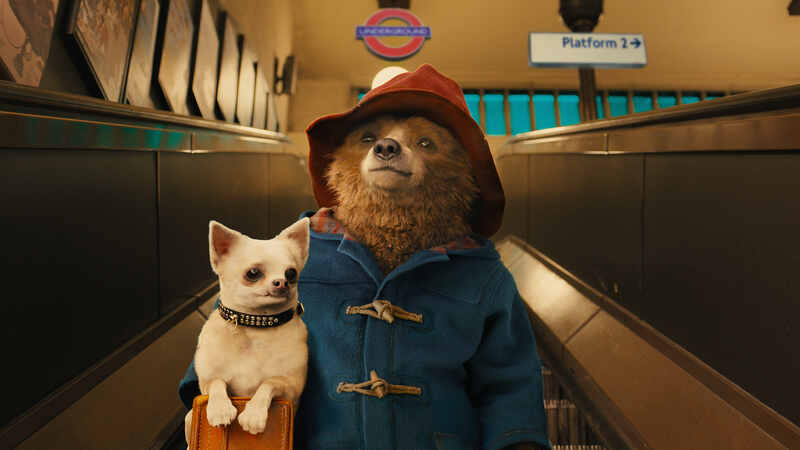 He is Paddington, who is very polite, expects the other characters to behave likewise, always means well, doesn’t quite understand the local customs, takes words literally sometimes, but is always trying to learn.That’s the bear I was hoping to see. Especially the last point – as a character, Paddington bear must always be interested in learning or the character just doesn’t work. I was on the lookout for wisecracks that the bear from the deepest depths of darkest Peru simply would not make. I was wrong, of course. Paul King has made a splendid film on so many levels that it is difficult to come up with reasons not recommend it. The bear is correct, and a lot of effort went into making Paddington fit into the London setting. Having learned everything about English culture from a series of records provided many years ago by an explorer (Tim Downie), Paddington has the right combination of the old-fashioned expectations that the English will always be proper and the lack of refinement expected of a provincial. His propriety makes him innocent, but his expectations make him endearing. Because he behaves with civility, the people he meets tend to overlook the fact that they are dealing with a bear. His bearness means that the English will not expect him to always behave properly. In proper English fashion, the bear is taken in stride, and dealt with like one would a confused child or foreign tourist, something I remember thinking was funny about the books as a child. Ben Whishaw gives voice to the endearing human inoffensiveness, while Framestore has carefully created a bear with human-like qualities who appears to be part of the environment and not painted in. Beyond the bear, the human cast seems to be taking their roles seriously, playing them for the comedy without ironic glances. Hugh Bonneville and Sally Hawkins, as the Browns, are very good at interacting with the bear and serving as surrogate parents, even if their roles are fairly typical. They respond the two conflicting aspects of Paddington. Hawkins mother sees in Paddington a lost child who should be helped, while Bonneville sees a bear that presents a danger. That Bonneville’s Mr. Brown is the one who will need to change his outlook in the end goes without saying in children’s films. But that doesn’t mean his story isn’t entertaining to watch. Cinematographer Erik Wilson and editor Mark Everson deserve much credit for bringing the film alive, along with, oh, about three to four hundred professionals listed in the visual effects and production design crews. The film has an incredible sense of depth and is visually stunning. They appear to have opened up the Hugo playbook but made it brighter. I read a few comparisons of the film to Wes Anderson’s stylings, but I think the comparisons to Scorsese’s 2011 work is probably more apt. Anderson’s style is a vision based on reading a book, or having someone tell a story. His images are lush, but flat, such that I am sometimes shocked when a character is able to back away from the camera. Like Hugo, Paddington is very self-consciously a movie. The emphasis is on volume, reminding us of the spaces outside of the frame and depth within spaces. Walls do not appear to be obstacles to moving between shots or scenes. If our imagination requires us to peer beyond a wall, that wall will open for us. The plush interiors and jungle settings often left me wondering which details of what I was seeing were real and which were added by the effects team. Overall, the self-consciously eccentric style of the film works. Even in parts where there isn’t much activity plot wise, the film itself is very active. While I might find all of the camera movements and changes in perspective overwhelming in an adult movie, in a children’s film I felt like it added to the whimsy of the affair. I was often wondering what new angle they would come up with next. I was never bored. Even a joke that was repeated several times in the film – that the music of the soundtrack is being performed by an actual band set up just outside of the frame – made me smile each time it was used. There may be one too many chase sequences, and the plot may be a borrowed concoction of 101 Dalmations and Mary Poppins, but it’s worth overlooking that to enjoy the qualities of the orphan bear as he finds a way to fit into his new home. This entry was posted in Animation, Comedy, movie reviews, UK, USA and tagged 2014 movies, children's films, comedies, movie review, paddington, usa. Bookmark the permalink.